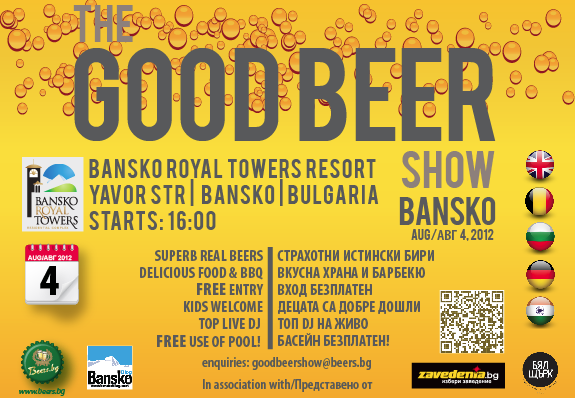 The Good Beer Show, Bansko is Saturday 4th August 2012 at 16:00 at Bansko Royal Towers (“BRT”). Not to be missed. I’ve been writing about beer in Bulgaria in the past and after a good hike, or a day’s snow boarding or skiing, a good beer is what touches the spot. The BRT (Bansko Royal Towers) is a fine location, a convenient place to stay and is ideal for meeting friends and making new Bansko contacts; all in a convivial, and family friendly, atmosphere. Relax, swim, eat, *drink and chill whilst top DJ, Shakermaker, spins the disks. So am pleased that Bansko Blog to helping publicise this event from beers.bg. Thank you to to zavedenia, Radio Tangra and Bansko Royal Towers for supporting this event. I will be there helping out serving the beer and I look forward to meeting up with old and new Bansko people. The start of the 2012 Bansko Jazz Fest (see link with full programme) is at 20:00 in the main Bansko town square. Take the gondola lift to the top. Go to Gondola lift for 09:00, Take gondola (return lift 10 lev) Then take special shuttle bus from from there to Vihren hut Sunday 5th. We will then have an approximately two hour hike at the pace of the slowest. Guiding is from the fabulously knowledgeable Bansko local guide, Stamenka, Speaking excellent English, she will explain the lakes, the formation of the mountains and point out the huge variety of flora and fauna. Children from 7 years old are welcome. Whilst no pre booking is required, priority will be given to those who drop me an email. No commitment; but helps guage numbers. Signing up for newsletter and the free 58 page “The Essential Guide to Bansko” will help you discouver the hiking routes in the Pirin National Park. Want more info on this guide, then click here. Are you coming? Then do please comment or email me. Click on the Facebook “Like” button below to keep up to date with the latest Bansko news and to share Bansko Blog’s story with your friends. Thanks for the write-up Lance – we look forward to seeing you there and enjoying a beer or two with you!